New to inflatable boats? Don't know what to buy? Too many products to choose from? We can help! • How much money you can spend? • Where to keep the boat when not in use? • How to launch the boat in water? • How many people will be in the boat? • What outboard motor to use? Saturn and BoatsToGo.com are offering the most affordable boats on the US market. Our prices are less than competitors simply because our business model is based on selling directly to the customers, while most other brands sell through the dealer's network, those dealers artificially raise prices to create hefty profit margins for a chain of middle men. Saturn inflatable boats vary in price from as low as $525 to $1600. In general, the larger boat size you can handle, the better! It means more cargo, a more comfortable ride, more space in case you have more guests aboard. There is a direct correlation between size and the price. However, there are also other considerations to take into account. Where to keep the boat when not in use? There are only 2 options for inflatable boats: It will either be sitting in water most of the time, which is not really good for the boat's overall lifespan. Or, it will be taken out of water when not in use. If the boat will be sitting in water all the time, its hull will be exposed to barnacles and algae will grow on the bottom, and rain accumulation along with mildew will occur inside the boat. Tubes will be exposed to direct sunlight and heat for prolonged periods of time. PVC boats are not as suitable for prolonged exposure to the heat, humidity and sunlight as more expensive boats made of Hypalon fabric. So, there is a tradeoff between price and durability of the PVC inflatable boat in the long run. If you plan to use inflatable boat dinghy for live aboard or towing it all over the World behind your main ship, leaving it on a dock uncovered, then your best choice would be the other brand of boats made of more expensive Hypalon fabric. This is not a secret, but all PVC boats of any brand or make have limitation due to heat and humidity exposure. If someone telling you otherwise, they are lying. If the inflatable boat is taken out of the water then there also only 2 options: It either will be deflated and folded for storage or placed on a boat trailer for transportation and storage. If the boat will be temporary folded for storage, it means that boat will be used occasionally, from time to time. It is highly recommended to keep the PVC inflatable boat that is not in use in a well-ventilated, shaded are, such as garage or under tarp shade. If the wet boat will be deflated, folded and closed in a locker box somewhere in Florida that is exposed to heat for prolonged period of time, humidity inside the box will eventually get into the wood and glue. If the boat will be kept on a trailer, such as Jet Ski trailer, or small boat trailer, it is highly recommended to either keep it set up in a garage or car port or under some kind of shade. Even a tarp spread overhead using ropes will provide some kind of protection against direct exposure to harmful elements. If garage or shade is not available, then boat cover must be used to extend PVC boat lifespan. So, therefore ask yourself, how and where you going to keep boat when it is out of the water? If you live in a condo, have small storage space or will be using boat with your RV vehicle, then you should definitely consider inflatable boat with air floor. If your storage space is limited, then you should consider inflatable boat variation – KaBoat. This is most portable type of boat with a motor transom on a market today! If you are looking for easiest way to assemble the boat, then go with a high pressure air floor. If you're going to keep and transport the inflatable boat in a trunk of your sedan car, then choose a KaBoat as the most portable option. If you have extra space in your SUV or Minivan, then choose a KaBoat or a larger SD series motor boat up to 9.6' long inflatable dinghy SD290. If you have a truck and can keep a deflated boat in a garage, then you can afford a 11' SD330 or larger inflatable boat. Boat with an aluminum or plywood deck is heavier than a boat with an air deck. Highly recommended for all models larger than SD365, especially if you wish to "plane" your boat at higher speeds. If you are concerned about overall boat weight but want the features of the air deck deck. If you are planning to inflate and use the boat for only 1 or 2 days, then we highly recommend inflatable boats with high pressure air floors. Assembly and disassembly of a boat with an inflatable floor is much easier and quicker than boat with a hard floor, such as with aluminum or plywood. If you need a larger boat and will be keeping it inflated for 2 days or longer, then you can consider inflatable boats with hard floors. The assembly of a hard floor boat is better done with help, and requires some practice to do it quickly. What is the difference between an air and hard floor? The air floor is already inside the boat and all it needs to be assembled is to unroll the boat and inflate all air chambers including the floor. The air floor is also removable in case if it needs repairs or replacement. Hard floors come in 4 or 5 separate pieces stored separately from boat tubes. The hard floor is heavy and requires some assembly steps. It is best to be used in a boat that is assembled most of the time and/or kept on trailers. All you need is to find the nearest boat launching ramp and push the boat from a trailer into the water. Hard floors are more rigid and durable than air floors. You can puncture the air floor with sharp object such as broken glass, fishing hook, knife, etc. However, you can protect the air floor from accidental punctures by cutting out and placing piece of vinyl flooring from your local hardware store over the air floor, inside the boat. When fully inflated air floor is very rigid, about 80-90% as rigid as plywood or aluminum floor. In most cases rigidity of the air floor is more than enough for flawless boat operation and use. Air floors can be inflated up to 10psi. And in most boats, properly inflatable keel provides additional rigidity to the air floor. We also offer 1 model Saturn inflatable boat SS260 with semi-rigid slatted floor. This boat is not designed for high speeds and most suitable as an affordable small dinghy or for lake fishing on a budget. How many people will be in a boat? All Saturn inflatable boats have a maximum person capacity posted in technical specification tables of corresponding boat model web pages. Maximum capacity will mean the maximum number of persons that can be safely squeezed into the boat and transported from point A to point B in a safe manner of operation. For example, you can bring the maximum number of persons from the main ship to the shore or transport during emergency rescue. However, for comfortable use of boat, without bumping into each other, it is advised to divide maximum person capacity in half. For example, 11' SD330 boat can squeeze maximum of 5 persons. 2 people can sit side by side on front bench, 2 on rear, and 1 in front. Even more people can fit into the boat if sitting on the tubes instead of benches. But, this set up will not be exactly comfortable for hours of fishing on a river or lake. Two or tree medium frame people can fit into this size boat really comfortably for long rides or fishing. Therefore you should consider how many people will be using boat most of the time and divide maximum boat capacity in half for long and comfortable ride or use. All Saturn inflatable boats have a maximum motor power ratings posted in the technical specification tables of corresponding boat model web pages. Max outboard motor means maximum power of outboard motor that can be safely used to plane the boat loaded to the maximum capacity at normal water surface conditions. However, you don't need to have the maximum motor capacity to go fast. About 75% of max motor capacity will easily put boat on a plane and fly at very nice speeds. For example, 9.9HP motor will really fly 11' Saturn SD330 boat with maximum rating of 15HP. 25HP motor will fly 15' SD470 at about 20 miles per hour, even though this size boat is rated to up to 40HP max. Do not over do it. Less power rating motors will cost less, will weigh less, will be easier to install/remove and will use less gas. Therefore, when selecting larger boats, 13' and up, with hard floor and big outboard motor, please take in account if you will have someone to help you to assemble boat, install motor and lunch it into the water. And then take it out of the water. Click on infographics below to zoom in. 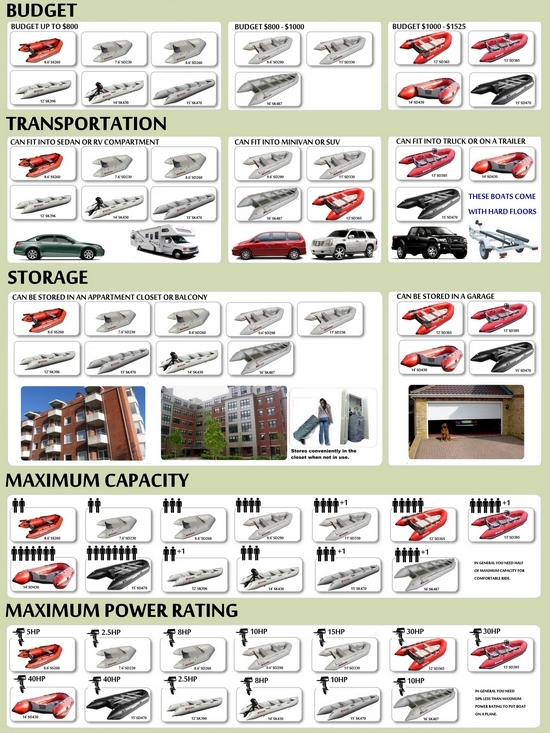 This infographic will help you to choose right model of Saturn inflatable boat based on budge, transportation and storage considerations, maximum persons capacity and outboard ratings.